Blasts In Baghdad Kill At Least 28 At A Busy Market : The Two-Way The Islamic State has claimed responsibility for a pair of bombings that killed at least 28 and wounded dozens of others Saturday morning in the Iraqi capital. 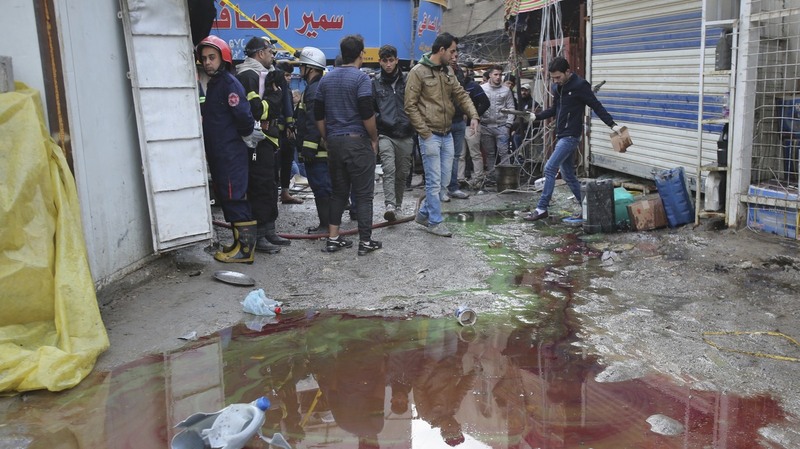 A crowded market in central Baghdad became the site of a double bombing Saturday morning. The Islamic State is thought to be responsible. A pair of bombings hit a crowded market in Baghdad on Saturday morning. Security officials say the first blast went off at around 8 a.m. local time; as people gathered to help the wounded, a man detonated a suicide vest. At least 28 people were killed and more than 50 others were wounded in the Iraqi capital. The Islamic State has claimed responsibility for the attack. "It is a reminder that although ISIS is under pressure from security forces in the city of Mosul, the group still has the capacity to cause havoc. More than two years after they declared a caliphate, ISIS still controls Mosul in Iraq, Raqqa in Syria and recently retook the historic Syrian city of Palmyra." Although most people in Baghdad are Muslim, Fordham says Christmas and New Year's Eve are still considered a popular part of the holiday season. Many people would have been celebrating on Saturday night.